Reminder: Event this Sunday, Nov 5th! Informational event at the Santa Barbara Eastside Library. Featuring a live video appearance by the author and activist Derrick Jensen. stopping the destruction and exploitation of life on Earth. Mainstream environmentalism has not been effective in stopping fossil fuels or any other extractive industries. Despite over 50 years of environmental activism in this country, we are experiencing the sixth mass extinction, global climate change, widespread pollution, total ocean acidification, and more–all directly caused by human activity. In a situation of life and death, shouldn’t we do everything we can to survive? Come learn about our analysis, strategy, and tactics for stopping the destruction and exploitation of life on Earth. Derrick Jensen is an award-winning author and has been described as “the poet-philosopher of the ecological movement.” His most recent book, The Myth of Human Supremacy, debunks the near-universal belief in a hierarchy of nature and the superiority of humans. Sign the petition here: http://www.safeenergynow.org/help_stop_750_new_extreme_oil_wells. Denver, Colorado–In a first-in-the-nation lawsuit filed in federal court, the Colorado River is asking for judicial recognition of itself as a “person,” with rights of its own to exist and flourish. The lawsuit, filed against the Governor of Colorado, seeks a recognition that the State of Colorado can be held liable for violating those rights held by the River. The Plaintiff in the lawsuit is the Colorado River itself, with the organization Deep Green Resistance – an international organization committed to protecting the planet through direct action – filing as a “next friend” on behalf of the River. The River and the organization are represented in the lawsuit by Jason Flores Williams, a noted civil rights lawyer and lead attorney in a recent class-action case filed on behalf of Denver’s homeless population. While this is the first action brought in the United States which seeks such recognition for an ecosystem, such actions and laws are becoming more common in other countries. In 2008, the country of Ecuador adopted the world’s first national constitution which recognized rights for ecosystems and nature; over three dozen U.S. municipalities, including the City of Pittsburgh, have adopted similar laws; and courts in India and Colombia have recently recognized that rivers, glaciers, and other ecosystems may be treated as “persons” under those legal systems. Serving as an advisor to the lawsuit is the Community Environmental Legal Defense Fund (CELDF), a nonprofit public interest law firm which has previously assisted U.S. municipalities and the Ecuadorian government to codify legally enforceable rights for ecosystems and nature into law. The lawsuit seeks recognition by the Court that the Colorado River Ecosystem possesses the rights to exist, flourish, regenerate, and restoration, and to recognize that the State of Colorado may be held liable for violating those rights in a future action. The complaint will be filed in the US District Court of Colorado on Tuesday. The fifth meeting of the DGR Santa Barbara book club was held on Sunday, September 10th at the Santa Barbara Eastside Library. We discussed chapters 7 through 11 of Deep Green Resistance: Strategy to Save the Planet. The discussion began by investigating approaches to unite environmentalists in effective action. The corporate PR campaign for “green” energy has co-opted the environmental movement; instead of fighting to save the planet and its inhabitants, many environmentalists with good intentions have been seduced into lobbying for industrial technologies that perpetuate a global system of extraction and exploitation. One person presented the idea that we might be more efficient in forming coalitions if we focus on organizing around anti-fossil fuel efforts because most people can agree on that. In the long run, anti-fossil fuel actions will be anti-industry (i.e. wind energy, solar energy, etc.) as industry depends on fossil fuels for extraction, global shipping, manufacturing, and construction. 1) Crowds of people in the streets scares those in power. 2) Hounding politicians at City Council meetings and other settings where working-class interests are not properly represented disrupts business as usual in favor of our community. 3) Bad publicity for and spotlighting questionable behavior of local politicians influences them to act like decent human beings. Contemporary media outlets have transformed the public’s view of “radical” politics to be extremist, but this simply isn’t the case. The true definition of the word radical is simply getting to the root of the issue. In practice, this means it is not enough to treat the symptoms; we need to identify and target the source of power for oppressive systems. As we discussed at the meeting, this almost always means that dismantling systems of exploitation will be uphill battles because the disparity in social power between intersecting social classes of people is enormous, and it is only growing. Therefore, we must use a variety of tactics that best suit our situation. The dogmatic belief that actions in and of themselves are good or bad is crippling to political movements. The meeting concluded with sharing stories about horizontal hostility (when those within the same social class waste energy fighting each other instead of their common oppressor class). This is a widespread problem in the Santa Barbara area. A few attendees shared their firsthand experiences with backbiting during their years in Santa Barbara. Whatever the exact cause for such hostilities, whether it be competing egos, defensive posturing, or quick tempers, the effects are detrimental to activists who work to create material change in their communities. See this Facebook event for more details: https://www.facebook.com/events/332681980511742/. The retreat is FREE but the organizers are asking for voluntary donations to pay for food/drink and to provide compensation for the facilitators. Please donate here: https://www.gofundme.com/Coming-Together-Weekend. The event location will only be released to those who RSVP. Please RSVP at the Facebook link above; if you do not have a Facebook account, email santabarbara@deepgreenresistance.org. The purpose of this book club is to explore how to mount an effective struggle against the destruction of the planet. Currently, we are reading the book Deep Green Resistance: Strategy to Save the Planet. Our next meeting is on September 10th at 2:00PM at the Santa Barbara Eastside Library. This meeting will cover Chapters 7 through 11. We encourage anyone interested in the book club to join us, even if you did not attend the previous meetings. 1) Have you struggled with the group dynamics of diffusive responsibility and/or pressure to side with the majority? What are some experiences you have had with consensus, hierarchical, and anything-in-between types of decision-making processes? 2) Is the distinction between aboveground and underground resistance groups clear to you? What are some key differences or similarities you think are important? 1) Do you agree with the 4 points preceding the sections entitled “Tilters, Descenders, Lifers”? Why or why not? 2) In your opinion, what are the important takeaways from the “Tilters, Descenders, Lifers” section? 3) How did the “Taxonomy of Action” chart affect how you think about political action and strategy, if at all? 4) What was your favorite part of the reading? Everyone at the meeting agreed with the four points at the beginning of Chapter 5: in order to avoid ecological catastrophe, the burning of fossil fuels has to stop, all activities that destroy living communities must forever cease, human consumption must be scaled back, and the human population must be reduced. The discussion reflected on how the last two points might be hard to digest for many people given the dominant paradigm, especially considering how efforts to thwart overpopulation are so closely associated with violent totalitarian regimes. The discussion continued with people sharing their conclusions about Tilters, Descenders, and Lifers. All three groups focus on preserving privilege rather than human rights and a liveable planet, and any solution produced by the three groups actually only makes things worse mostly through propagating extraction, hoarding resources, and obstructing efforts to directly confront systems of power. We shouldn’t protect systems of power that destroy the planet; we should dismantle them. The Taxonomy of Action chart displays a list of actions according to the inverse relationship between how risky an action is and how many people are required to complete it. It is completely factual and absent of assigned values. For this reason, the chart acts as a great preliminary guide to planning political actions. The discussion at this point focused on the participants’ perspectives of violent and nonviolent actions, and how these are defined. Acts of sabotage against pipelines sparked discussion on the effectiveness of one action versus a series of actions, and what an effective reaction by authority figures might look like. If you are interested in attending future book club meetings, subscribe to our local chapter news using the box on the right side of our website. Our next meeting is on August 19th at 2:00PM at the Santa Barbara Eastside Library. This meeting will cover Chapter 5: Other Plans and Chapter 6: A Taxonomy of Action. We encourage anyone interested in the book club to join us, even if you did not attend the previous meetings. 1) Do you agree with the 4 points preceding the section entitled “Tilters, Descenders, Lifers”? Why or why not? On May 19th, 2017, members of Deep Green Resistance Santa Barbara attended the Water Is Life: Standing With Standing Rock conference hosted at UC Santa Barbara. This conference was presented by the Carsey-Wolf Center, the American Indian & Indigenous Collective, the American Indian Student Association, the Coastal Band of the Chumash Nation, the Division of Humanities and Fine Arts, the Interdisciplinary Humanities Center, and Red Lightning, in addition to receiving support from many other co-sponsoring organizations. The conference commenced with welcomes from members of the Chumash Nation and conference co-organizers. The history of environmental activism in Santa Barbara was mentioned, being catalyzed by two large oil spills in the Santa Barbara region. Despite environmentalists’ efforts, fossil fuel production has only expanded in the region, most recently with three large oil & gas projects proposed in the past few years. 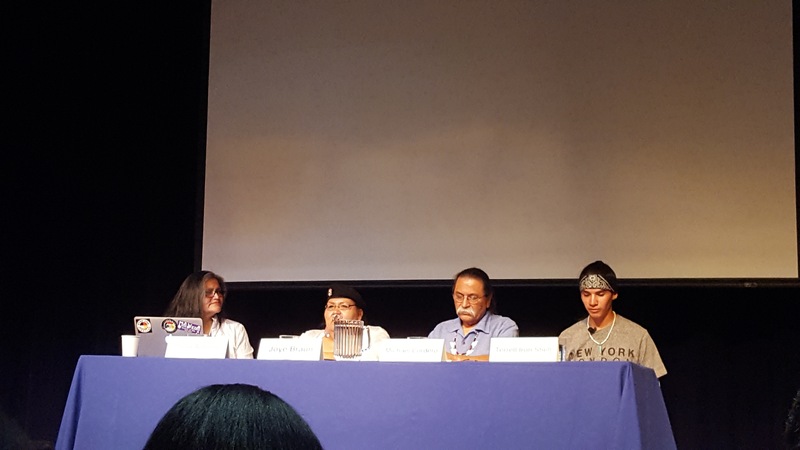 The conference co-organizers expressed their gratitude to the Standing Rock water protectors who traveled to the university to speak, and recognized that we have a lot to learn from them about how to protect the water and land here in Santa Barbara. After the introduction, there were three panels centering around different themes. The first panel, entitled “Protecting the Land and the Water,” was moderated by Margaret McMurtrey, a doctoral student in the Department of Religious Studies with an emphasis in Native American Studies. Participants included Mark Tilsen, Jasilyn Charger, and Joye Braun. Tilsen is an Oglala Lakota poet, and he served as a nonviolent direct action trainer and police liaison at Standing Rock. He shared his experiences with security at Standing Rock, noting that the water protectors were aware that there were many malicious infiltrators, in addition to well-meaning “visitors” in the camps. Their presence made adhering to security culture paramount because of the risk of these infiltrators spreading news to law enforcement or others. Tilsen now focuses on helping communities to divest from the pipeline, criticizing the “extractive economy” of the dominant culture. Jasilyn Charger and Joye Braun are both members of the Cheyenne River Sioux tribe, and two of the first people to camp at Standing Rock in resistance against the Dakota Access Pipeline. Charger helped found the International Indigenous Youth Council, and stated that she became a water protector after hearing the Earth telling her to help. She reminded the audience that the entire Earth is connected, and that “we need water…[but] we don’t need iPhones.” That may sound like common sense (and it is probably completely rational to anyone not infected with the wétiko virus), but it is a profound statement in a world where members of the dominant culture have perpetually destroyed the very land and water on which they depend. Braun spoke of the universal values that united people from many difference backgrounds at the camp, including generosity, honesty, respect, and compassion. She emphasized that hierarchical social systems like the dominant culture don’t work–those hierarchies are what have gotten us to where we are now–so we need to throw them away and decolonize in order to establish a sustainable way of living. Panel 1: Protecting the Land and the Water. From left to right: Margaret McMurtrey, Joye Braun, Jasilyn Charger, Mark Tilsen. Photo by Charlie Mountain. After Tilsen had to leave because of a prior engagement, the conversation turned to the role of women in leadership. Charger encouraged women in the audience to disobey the traditional feminine gender role: to be brave, powerful, and outspoken, and not to care about being pretty. She believes women are sacred and have a spiritual connection to the Earth because they can create life. But patriarchy has caused women to forget that they are sacred because they are so disrespected, especially native women who suffer much higher rates of abuse than the general population and are raped in “man camps” that accompany large extractive projects. Braun agreed with Charger, and added that the western, civilized, patriarchal point of view has distorted relationships between native women and men by introducing the male supremacist power dynamic. Patriarchy was enforced in indigenous communities through the Christian church & boarding schools, and the destruction of traditional indigenous knowledge, spiritualities, and cultures. The second panel focused on media at Standing Rock. Independent filmmaker Todd Darling, who spent several months at Standing Rock documenting the struggle against DAPL, moderated. John Bigelow, Paula Antoine, and Myron Dewey spoke about their experiences as part of the media team. Bigelow, a Hunkpapa Lakota, created the Oceti Sakowin Camp website and media team to send communications from the camp to the outside world. He spoke of how he lost his “journalistic objectivity” after seeing the way the police abused the water protectors at Standing Rock; he also emphasized the importance of freedom of speech, especially under the current White House administration. Antoine, a Sicangu Lakota and grandmother, co-founded the Rosebud Spirit Camp in opposition to the Keystone XL pipeline. She served the role of cultural adviser for various tribes at Standing Rock. Dewey is from the Walker River Paiute Tribe, and founded Digital Smoke Images. He mentioned the Water Protector Legal Collective, which is providing legal assistance to 814 people arrested at Standing Rock. Antoine added that about 20% of those cases have been dismissed due to lack of evidence. Panel 2: Media. From left to right: Todd Darling, John Bigelow, Paula Antoine, Myron Dewey. Photo by Charlie Mountain. Dewey echoed Bigelow’s concerns about freedom of speech and the importance of independent media, as the mainstream media largely ignored the events at Standing Rock. He live-streamed video footage from the camps on Facebook many times, providing one example when law enforcement was harassing him. Dewey believes that had he not had his camera rolling at that time, his life may have been taken. The morally reprehensible behavior of law enforcement towards the nonviolent water protectors was a constant theme throughout the struggle against DAPL, and drawing media attention to these events helps to garner public sympathy. Corporations and governments know this, which is why they attempt to intimidate journalists and curtail freedom of the press. The third and final panel of this conference was titled “Decolonization and Indigenous-Centered Leadership,” moderated by Paula Antoine. 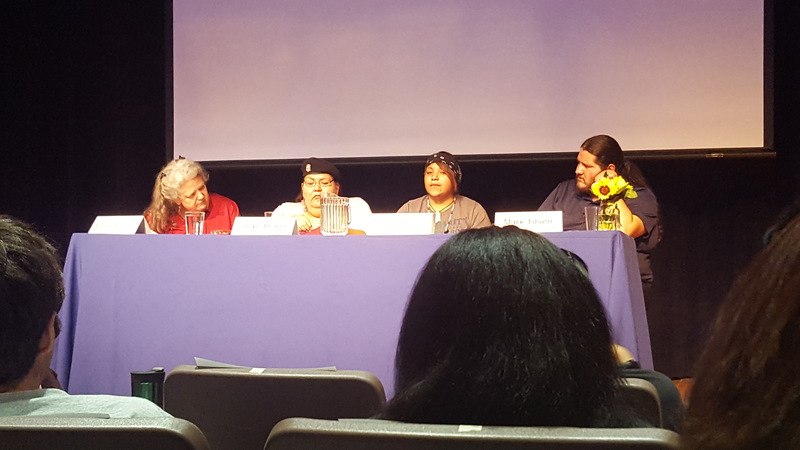 Terrell Iron Shell, one of the founders of the Indigenous Youth Council, Michael Cordero, an elder of the Coastal Band of the Chumash Nation, and Joye Braun participated in the panel. Iron Shell, an Oglala Lakota and Eastern Band Cherokee, conducted nonviolent direct action trainings at Standing Rock. He believes that the youth must be the spark to light a fire in the next generation, and we must take our power back from those who are currently in charge. He asked the audience, “How long are you going to let someone else make decisions for you?” Cordero helped to found the Santa Barbara Standing Rock Coalition and to write the resolution in support of Standing Rock, which was passed by the Santa Barbara City Council in November 2016. He drew parallels between the struggle against the Dakota Access Pipeline and the Chumash’s struggle against a proposed LNG plant at Point Conception in the 1980s. He believes that one of the most important messages he learned from Standing Rock was that alliances must be formed, especially between native peoples, in order for movements to be successful. Braun shared the story of the day that the Treaty Camp was established on land that the pipeline was meant to cross, but had never been legally ceded by the tribe. She described the experience as freeing, and encouraged us all to think outside of the box like she and her comrades did that day. Panel 3: Decolonization and Indigenous-Centered Leadership. From left to right: Paula Antoine, Joye Braun, Michael Cordero, Terrell Iron Shell. Photo by Charlie Mountain. Oil pipelines are everywhere, and they affect everyone. If you are white enough, rich enough, and/or lucky enough, the pipelines might not be built in your backyard, but no matter who you are, they contaminate the water, air, and land upon which you depend for your life. The distance does not keep you safe, it only delays alarm. There are no safe places to hide from a culture and economy based on extraction, drawdown, theft, genocide, and ecocide; this culture eats beautiful forested lands, rich seas, and clear skies and leaves behind deserts, toxic dead zones, and, possibly in the near future, an inhabitable planet. If it doesn’t seem like this culture and its economy steals wealth of all sorts for the benefit of a few, it’s very likely that you live in an exclusion zone rather than a sacrifice zone. The exclusion zones are where resources are sent, where power is concentrated, where the in-group is nourished. Sacrifice zones are where resources are extracted, where power is enforced to maintain subjugation, where the out-group is impoverished. Even if you recognize the material problems this culture produces, its strong tradition of silencing dissent, erasing indigenous cultures and knowledge, and spreading self-serving disinformation obscure the root cause of these problems. For thousands of years, the dynamic of the haves and the have-nots has been at the core of an evolving culture that dominates and erases other cultures. It has taken many forms, including city-states, empires, kingdoms, feudalism, mercantilism, colonialism, white supremacy, patriarchy, capitalism, and fascism. The common denominator is a selfish urge to profit at the expense of others, beginning about 10,000 years ago with the advent of agriculture and male subjugation of women. This developed into various socioeconomic structures that depend on and thus facilitate the destruction of life. The dominant culture abuses the earth just as it abuses women. People who live in the Santa Barbara area know firsthand what oil infrastructure means. Whether the infrastructure takes the form of offshore oil platforms, oil pipelines, or something else, spills are almost a guarantee. In 1969, an estimated 3 million gallons of oil spilled from Union Oil’s Platform A into the Santa Barbara Channel; the spill continued at over 1,000 gallons an hour for about a month. This was the largest oil spill that had ever occurred in US waters, and is considered by many to have catalyzed the modern environmental movement. Stretching over 35 miles long, the oil slick covered beaches, birds, and marine life, the blowout was caused by inadequate safety measures taken by Union Oil (aka Unocal), similar to how the more recent spill from the Plains All American Pipeline in May of 2015 was caused by inadequate maintenance. When approximately 143,000 gallons of oil are spilled into the ocean, someone should be held accountable for his actions. Plains All American, the company responsible for the pipeline, is still under investigation for their disastrous operational record of the pipeline. Since the spill in 2015, the pipeline has not been in operation. This has recently forced Venoco, an oil company who operated an offshore oil platform in the Santa Barbara Channel as well as onshore facilities, to file for bankruptcy, leaving the decommissioning bill to the State Lands Commission. The global economy is based on the unsustainable extraction of natural resources. The top decision-makers of corporations, mostly white men, take what they can and try to sell as much of it as soon as possible. When some of the real, non-financial costs come to light, these rapacious entities move out and leave the clean-up to somebody else. There is no justice under business as usual. Oil surrounds the feet of local resident Morgan Miller as he patrols the beach for oiled wildlife on May 19, 2015 north of Goleta, California. Photo by David McNew/Getty Images. How do we effectively resist something that is powerful enough to eliminate entire species and cultures from our world, colonize and enslave many lands and populations, pollute and scar our homes, and even drastically change the global climate? Effective resistance begins with properly identifying a few key points: the problem, our goal, and a strategy, i.e., a path to achieving said goal. The problem we face is immense and complex. It is a global network of systems that consolidate power by taking it from others. It is huge and powerful, but it is vulnerable. We can’t sit idly by out of fear, incompetence, or naive hopefulness. We must act. As Tilsen said at the Water Is Life conference, “We need incredibly brave, unreasonable people to step up… and we need to follow them.” If we don’t, civilization will eat our planet until there is no life left. But what does it meant to resist? Speakers at the event discussed the decision that water protectors made in differentiating themselves from protesters. For many people who spoke at the conference, the distinction is dedicating your life to protect the water, rather than committing a one-time act that accomplishes no material change. Resistance isn’t a fad, it is a state of living. It is not a lifestyle choice, it is a life-changing choice. We must stand collectively against fossil fuel and other key infrastructure that maintain the global industrial complex. The tactics we employ must be specific to our goals, but we also must be wary of the unintended consequences of our actions. Michael Cordero advised that in order to be successful as a movement, we each need to look at the material impacts of the status quo and understand what it will take to resist, what are the specific challenges we face, and who are these challenges going to affect; this is necessary to consolidate smaller, more individualized efforts into a more effective collective effort and helps to create an effective long-term strategy. The easiest way to form an effective strategy is to look at what worked in the past. When a nearby sacred place known as Point Conception was threatened by the construction of an LNG plant, local Chumash and their allies used similar tactics as were employed at Standing Rock to ensure it was never built. But victories like this will only be temporary as long as corporations still have the power to steamroll local communities. And no matter how peaceful the resistance is, the backlash will be extremely violent. Indigenous peoples on this continent have been resisting the dominant culture for centuries. Photo by Orlando Begay. Contrary to what most “environmentalists” say, there is no sustainable future with solar panels and wind turbines or some other “green” energy. Do you ever wonder why the question is: how do we keep the power flowing and growing? instead of: how do we improve our landbase? how do we enter into mutually beneficial relationships with those around us, both humans and non-humans? Instead, we should look to those who have continued traditions that have lasted for thousands of years. We need to listen to indigenous voices for many reasons, and self-preservation is just one. Restoring relationships between people is another. Healing the land is yet another. Civilization has been destroying landbases for thousands of years. Contemporary environmental destruction is so starkly “destructive” only because it is industrialized and mechanized. In the US, specifically, the governments have been committing ecocide and genocide since their arrival. The attack on indigenous peoples has not stopped, the tactics have just shifted. We can’t keep trying to reform the global culture of colonial imperialism. We need a serious resistance movement to create biophilic human communities, for the sake of life on Earth. And to figure out what that means today, we can start by listening to those who have been fighting this fight for generations.